Choosing the best dual-WAN router may prove to be a bit difficult since this type of devices weren’t created for home use, their functionality and complexity being way beyond the needs of the usual user (setting up a multi WAN router can be tedious and, sometimes, outrageously confusing). 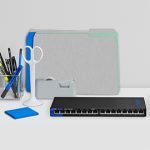 You will need some networking knowledge to create and maintain a proper Internet network (but, with the emergence of the DOCSIS 3.1, we may actually see more and more dual-WAN routers emerge from the consumer market). By now, everyone has a router inside their home and knows that these small boxes have the role of supplying access to the Internet to all connected devices. 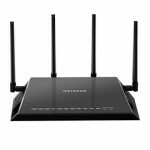 You may have also seen all those crazy looking routers with lots of antennas and equipped with hardware capable of delivering performance way beyond what the normal user would need. That’s because most aim at the businesses and corporations (and the price is a clear hint to this). But, regardless of the router’s performance, most business owners don’t really want to spend a fortune, but still want to be able to have a continuous and stable Internet connection. This is where dual-WAN routers come into play. UPDATE 06.13.2018: The Peplink Balance One has been added to the best dual-WAN routers list. Multi-WAN routers are usually used by business (no matter their size) and were created to give your organization an edge over the competition by maintaining a stable Internet connection, without relying on a single ISP. This is extremely important because running a business successfully can’t allow any downtime period (and nowadays, being connected to the Internet is a vital point for ensuring the survival of a company). But this isn’t the only advantage a Dual (or Multi) WAN router can deliver. You can also get better throughput and uniformly balance the handling of your packages between the two (or more) separate connections (to avoid bandwidth throttling). This desirable feature is called Network load balancing (or multihoming) and, besides balancing the network usage, it will also provide network redundancy, meaning that, if one of the WAN links fails, you still get access to your network resources using the secondary WAN link. Now, you may wonder why not simply go for multiple routers instead of a multi-WAN single router? As expected, the answer is the price. Since we saw how important it is to have a multi-port router when running a successful business let’s look at the best dual-WAN VPN router solutions that the market has to offer. The ZyXEL USG40 is a capable dual WAN router specifically designed to be used in a small business environment (for networks with 1-10 users or a maximum of 20,000 connections). The USG40 was released in the summer of 2014, being part of the Performance series of the UTM devices (Unified Threat Management) alongside USG40W, USG60 and USG60W. 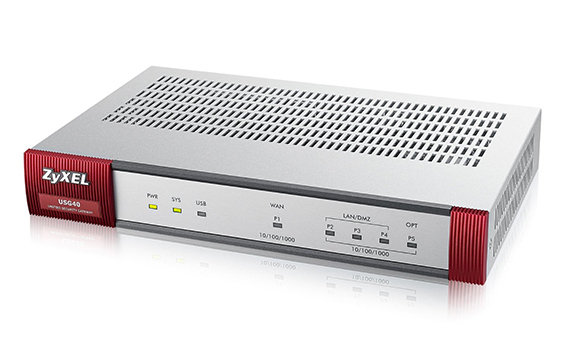 The ZyXEL ZyWall USG40 looks like your ordinary router, featuring a grey metallic rectangular box, with lots of heat vents on top and the sides. Overall, the design feels rather bland, even though there are two red front parts for the logo and model, but this still doesn’t really give many points in the appearance sector. Sure, it is likely that the router will be put in a place out of sight, but I can’t help to compare it with the newer, crazier designs some other router manufacturers have adopted, it just feels a little outdated. On the front, in between the red accents, there are the LED status lights responsible for Power (PWR), System (SYS), USB and five Ethernet ports (P1 to P5). 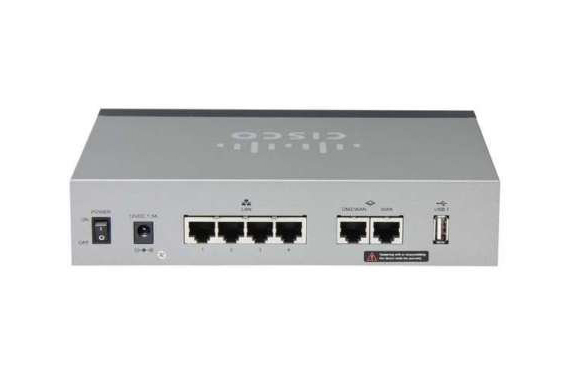 The back of the USG40 is home to the Power adapter, an ON/OFF button, a Console port (used for managing the router using CLI commands – you will have to enter the username and password), a USB 2.0 port, a WAN port, four LAN/DMZ Ethernet ports (the last port is optional and can be used as WAN or as LAN) and a recessed RESET button (which can be accessed using a paper clip). Some other things I liked is how silent it felt, although it is a ‘heavy lifter’ (because of the passive cooling), the rubber feet for extra stability and that it wasn’t really huge, measuring 9.5×6.8×1.4 inches and weighing 32oz. The outside may not be much, but it’s the inside that counts. 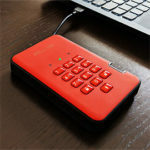 The ZyXEL USG40 features an one-core Cavium CN6010 CPU, backed by 1GB of RAM, 4GB of storage memory and a Qualcomm Atheros AR8327-BL1A switch. 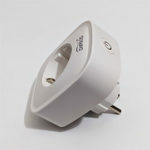 In terms of wireless connectivity, you will either have to purchase the USG40W, which uses the 2.4GHz band (being compatible with the 802.11b/g/n standard) or the more advanced USG60W which allows you to also use the 5GHz radio band (the W stands for wireless). 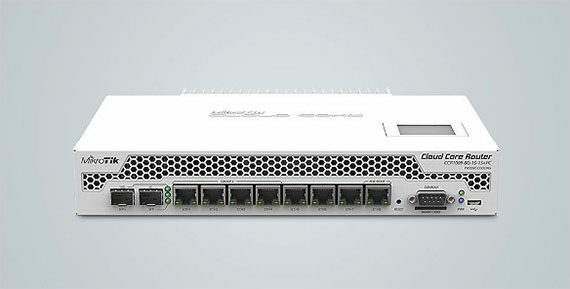 In terms of applications, the ZyWall USG40 mainly features IPv6 routing, VPN connectivity, load balancing, user-aware access control and SSL VPN Network access. So, the USG40 allows you to create IPv6 policy routes and objects, but at the same time, also allowing IPv6 packets through IPv4 networks. The VPN connectivity allows you to create secure paths with other companies or offices and provides safe access to your network. Load balancing is maybe one of the most important aspects of a dual WAN router as it will balance the traffic loads between multiple Internet connections on the same or different ports. The SSL VPN was designed to allow external access to your internal network. This way, remote users can enter the ZyWALL web address into a browser and after they have entered the username and password, they are given a private IP address in the same subnet as your network and access to the needed resources. 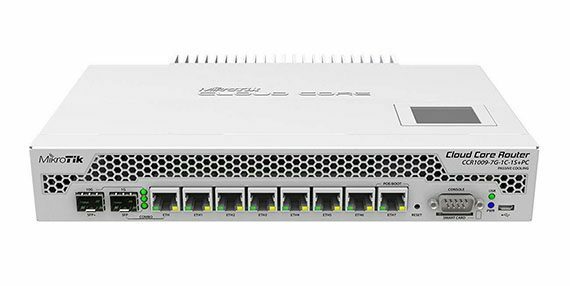 Also, since security is paramount when talking about maintaining a business-type network, the ZyWall USG40 is a very secure router, being equipped with a SPI firewall (Stateful Packet Inspection) and UTM features (Unified Threat Management). Unfortunately, in order to access the latter, you will need a licence. 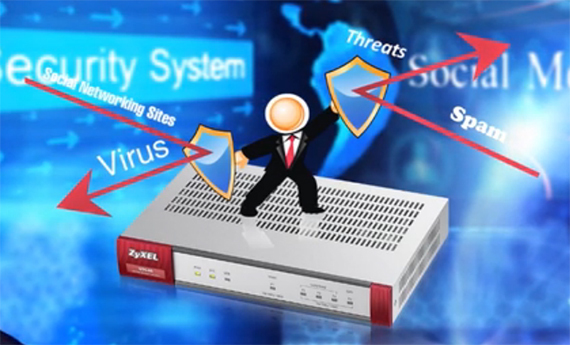 The UTM includes Application Patrol (filter or throttle traffic), Intrusion Detection and Prevention, Anomaly Detection and Prevention, Content Filtering (it can be controlled by the type or category of the threat – like botnets, malware, phishing and so on), Anti-Virus (Kaspersky), Anti-Spam and Secure Socket Layer (SSL) encrypted traffic inspection. Lastly, I have tested the ZyXEL ZyWall USG40’s performance using its default settings and I got 265 Mbps while downloading a 1GB file and 215 Mbps while uploading the same file. Mikrotik is a well known networking company in the enterprise market, while it’s less popular in the consumer market for the same reason: the great, but very complex RouterOS which has a steep learning curve, but it does offer an incredible amount of customization and flexibility and, while their competitors often deliver a similar set of features, it usually comes at a vastly higher price tag. Pair the RouterOS software with the large variety of appliances and you get a great solution for small to medium businesses. 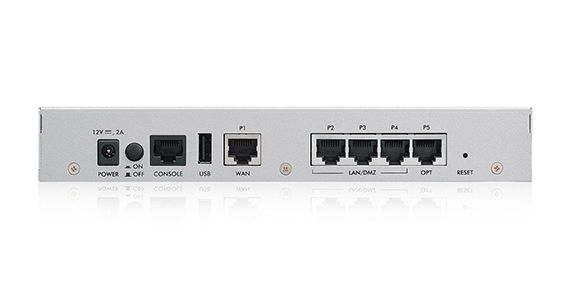 Since we have focused on small business dual WAN routers, the device of interest is going to be the Mikrotik CCR1009-7G-1C-PC, which comes with some major improvements over the last generations, such as the no switch-chip, so the Ethernet ports are now completely independent and have a direct connection with the CPU, thus completely removing any possible bottlenecks or any other types of performance loss. At first glance, the Mikrotik CCR1009-7G-1C-1S+PC features the same metallic rectangular box that we find with most other Dual WAN routers, but, the Latvian-based manufacturer has a (good) habit of adding some design elements that will make their devices more interesting-looking than those from the competition. This time, the case is a bit taller, with some various cut-out patterns all around the body of the router: on the front just above the ports, on both the lateral side, as well as on the bottom side and even if it isn’t immediately obvious, there are some positioned on the rear side, but they’re covered by an unusual heat-sink (the case is entirely covered by a white matte finish which does not retain fingerprints). 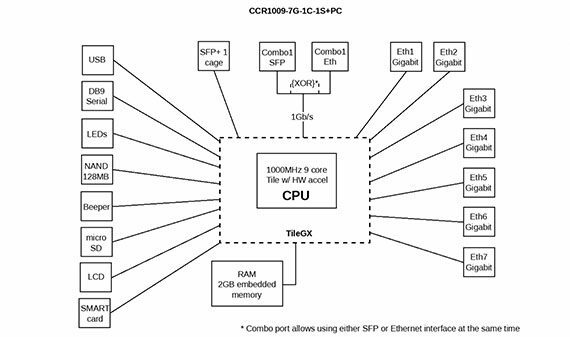 The reason for that is because the CCR1009 relies on passive cooling and, since this is a powerful device, it needs as many vent holes as possible, but this are not the only measures Mikrotik took to ensure that the device remains cool, because it has also added a two heat-pipe internal system along with the aforementioned specially designed rear-positioned heat-sink (this way, even if you use the router at its maximum, the case will still remain cool (the heat-sink will naturally be a bit hot) and you won’t hear that annoying fan buzzing – it’s completely silent). On the front side, underneath the long vent holes, there is a 10G SFP+ port (with two LED lights for Power and Activity), a regular 1G SFP port which, along with the first Gigabit Ethernet port which can create a combo-port, so it allows the user to choose which interface it prefers from the software, as well as having a hardware fail-over feature in case of a disconnect. Further to the right, there is a set of seven Gigabit Ethernet ports (each with its own set of two LEDs) and be aware that the seventh port can be used for powering the router using passive PoE power (18-56V), while also allowing the user to use Etherboot / Netinstall for reinstalling the RouterOS. Besides the Ethernet ports, there’s also a Reset button (press and hold it during boot time until the LED lights start flashing and then release it to return the device to its default RouterOS configuration), an RS232 serial port with a Smart Card tray directly underneath it (the card must support GlobalPlatform JavaCard and is used to store your private key for features which support the Certificate based authentication), two LED lights, one for USR (User activity) and the other for PWR (Power) and, lastly, there’s a microUSB type AB port which can be used in various ways (such as for connecting a storage device or a 3G/LTE modem). Turn the device around and on the left side of the heat sink, you’ll notice the DC 18-56V input jack as an alternative to the PoE port (on the left there are three ears to easily manage the cable) and on the right side, there’s a microSd card (inside a carved in area) and a wing nut. On top of the device, there is a small LCD touchscreen display which requires a bit of pressure to register a touch (as opposed to a smartphone display) and, similarly to pretty much every element of this device, it can be configured from the console menu: some of these settings allow you to change the colour scheme, choose the default info to be displayed, select the interface (performance stats, the connected clients, the bandwidth and more), set up an LCD PIN code and others. Note: The router can be positioned on a flat surface or can be rack mounted. Inside the case, the Mikrotik CCR1009-7G-1C-1S+PC is equipped with a TILERA TILE-Gx9 TLR4-00980CG-10CE-A3a CPU clocked at 1GHz (the CPU core count is 9), 2 GB of RAM (the lighter version CCR1009-7G-1C-PC only features 1GB of RAM) and 128 MB of NAND storage memory. 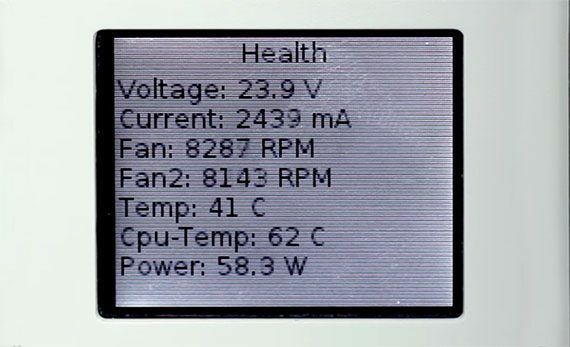 Additionally, the router also features a PCB and CPU temperature monitor. As I said in the introduction, every Mikrotik device comes with the RouterOS software (level 6 license) which is a very extensive and complex tool which allows for a great number of configurations for the initiated user (you do need to learn the way it functions and, thankfully, Mikrotik has provided lots of guides and a dedicated wiki page for every new user that want to learn: https://wiki.mikrotik.com). Of course, the object of interest is the dual-WAN capability (which includes load-balancing and the fail-over system) and the Mikrotik CCR1009-7G-1C-1S+PC does deliver a lot more control than expected. The RouterOS allows you to set up a dual-WAN setup using the PCC method (Per Connection Classifier), which is an interesting way of dividing the traffic into equal streams, while also keeping some data (with specific sets of options) in a particular stream, as well as enabling a failover, in case a gateway fails. There’s also the Firewall marking method, which can be broken up in several applications, such as the Per-Traffic Load Balancing (useful in case you don’t have enough bandwidth for only one connection, therefore you can load-balance multiple Internet connections – this method involves breaking traffic in different types, using the Mangle Tool to mark the traffic, allowing some IP addresses to bypass this type of load-balancing and creating specific routes based on the marked traffic), the Load Balancing over Multiple Gateways, Load balancing multiple same subnet links and others. Other methods that can be used are the ECMP (Equal Cost Multi-Path), OSPF (where multiple links are set up using the dynamic routing protocol OSPF with equal cost) or BGP (to perform load-balancing when there are more than one equal cost links between two BGP routers). Of course, this is only scratching the surface of what the RouterOS can do with the router’s hardware, but it is enough to put the Mikrotik CCR1009-7G-1C-1S+PC among the best dual-wan routers on the market in 2018. Ubiquiti is known for making high quality networking devices, with enterprise-like features at a really low cost and the EdgeRouter Lite ERLite-3 is one of the most reliable low-cost VPN routers for a small company. 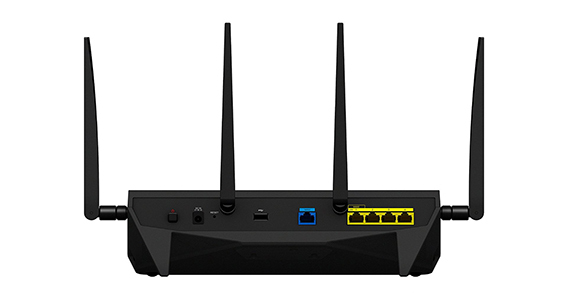 The EdgeMAX EdgeRouter Lite ERLite-3 is not really a Dual WAN router per se, but this function became available after the release of EdgeOS v1.4.0 (you should always download the latest firmware, by accessing the manufacturer’s page), which made possible the addition of the dual WAN load balancing wizard. As you will see from other router reviews, I appreciate high performance, but I also consider that the design as an important factor often overlooked by networking devices manufacturers. 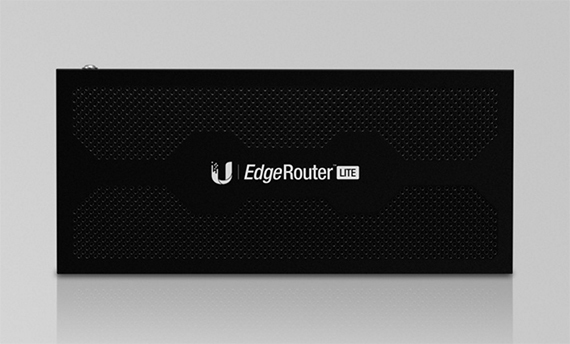 Fortunately, the Ubiquiti agreed with us and the EdgeRouter Lite looks a lot more stylish than other Dual WAN routers. Sure, it features the same rectangular black box (made of plastic), but the reduced size and the EdgeRouter LITE logo on top, near the hexagonal pattern of the heat vents enhance the overall look and don’t make the router feel cheap (there’s also a variant with chamfered edges). On the front of the router, you can find the Console port (you will need a DB9 port on your computer to be able to connect to the Console port), three Ethernet ports (marked from 0 to 2) and a recessed RESET button (accessible with a paper clip). There is no array of separate status LED lights, but you do get a LED on the left side of each port (Amber means link established at 10/100 Mbps, Green means link established at 1000 Mbps). The back of the router is mainly occupied by ventilation holes, but there’s also a Power port and a Grounding Hole (with a screw). As said before, EdgeRouter ERLite-3 is a router of small proportions, measuring 7.7×3.5×1.1 inches and it weighing 10 ounces, meaning, it’s rather light. This isn’t necessarily a good thing, as it doesn’t really feel sturdy and may actually fall of the table. But, if that’s the case you can wall mount it, just make sure you position the router with the Ethernet ports downwards (make sure the logo isn’t upside down) and don’t obstruct the ventilation holes. Now, let’s have a look on the inside. The ERLite-3 has a dual-core Cavium Octeon CN5020 (based on the MIPS64 architecture – featuring Hardware Acceleration for Packet Processing), 512MB of DDR2 RAM and 2GB of flash storage (built-in mini USB key). 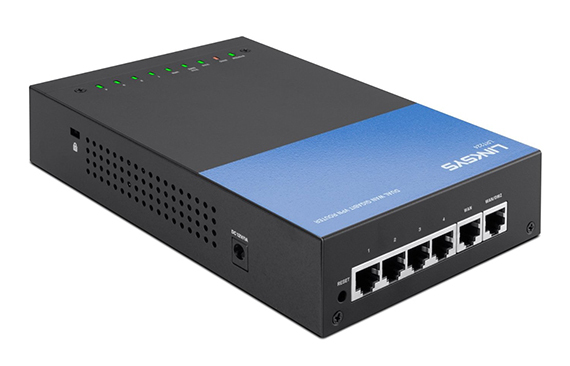 Furthermore, there’s also an Atheros AR8035 Gigabit PHY (x3) switch. EdgeMAX EdgeRouter Lite ERLite-3 doesn’t have any WiFi capabilities, so you will need an additional wireless access point if you want to use the 2.4Ghz and/or the 5GHz radio bands. As said before, the EdgeRouter Lite ERLite-3 uses the EdgeOS, which, from the 1.4.0 version, allows you to choose from three types of configurations Load Balancing, WAN+2LAN and WAN+2LAN2 (from the Wizards tab). The Load Balancing feature is extremely important as it allows you to spread the traffic across both links, increase the bandwidth and not worry about downtime (in case a link fails, it automatically switches the other one). In terms of applications, the ERLite-3 supports IPv6 routing, IPSec Site-to-Site tunnels, PPTP and L2TP Remote Access, PPTP Client and OpenVPN Site-to-Site tunnels. Security is also paramount and Ubiquiti EdgeMAX EdgeRouter Lite ERLite-3 doesn’t disappoint, featuring an ACL-based Firewall (the access control list is used for traffic filtering), a Zone-based Firewall (a very advanced form of creating security zones and implementing security policies towards the traffic between these zones) and NAT (which blocks unsolicited inbound traffic). Lastly, I have tested the speed performance of the Ubiquiti ERLite-3 using a 1GB file and we measured 770 Mbps for downloading the file and 745 Mbps for uploading it. 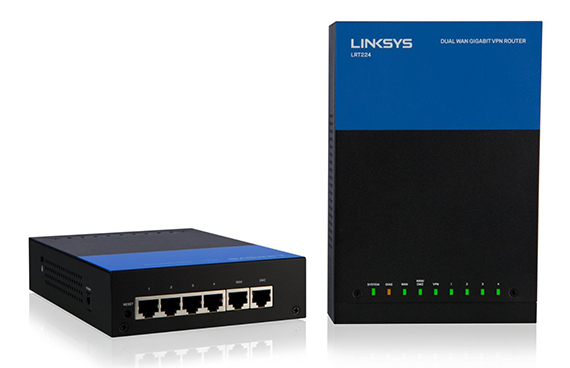 The Linksys LRT224 is another great choice to go for when searching a reliable dual WAN router to keep your business connected to the Internet. 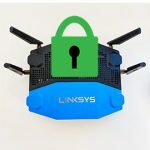 Linksys had a very successful run in the networking market (especially thanks to its iconic Linksys WRT54G) and it has still managed to remain relevant even today, regardless of its fierce competition. The LRT224 looks identical to its relative, the LRT214, featuring the same black and blue metallic box, having the heat vents on the sides. Although it has the generic box shape, the LRT224 is surprisingly stylish, especially thanks to the blue accent on top and the big blue logo on the front. Sure, there are other better designed and more appealing routers out there, but the LRT224 doesn’t feel like you need to hide it immediately after you have connected all the cables. Also, it does manage to bring in a healthy dose of nostalgia (reminding me of the WRT54G). Like said before, the front of the router is occupied by the Linksys logo, the LED status lights being positioned on the top, in between two screws. The LEDs are responsible for SYSTEM, DIAG, WAN, WAN/DMZ, VPN and the four LAN Ethernet ports. The back of the Linksys LRT224 is home to a recessed RESET button (press the Reset button for 5 seconds to warm reset the router and press it for longer than 10 seconds to perform factory reset), four LAN Ethernet ports, one dedicated WAN port and one last port that can be used as either a WAN port or DMZ. The power port can be found on the right side, along with the K-Lock security slot. The LRT224 isn’t a big router, measuring 5.2×7.7×1.7 inches and weighing 25oz and can be wall mounted by using the slots on the bottom panel, just make sure not to obstruct the heat dissipation holes. Under the hood, the LRT224 is equipped with a single-core Cavium CN5020 CPU (clocked at 300 MHz), backed by 128MB of RAM and 32MB of flash memory. The router is also equipped with a Broadcom BCM53125M and a Broadcom BCM54612 Ethernet switches. Unfortunately, the Linksys LRT224 doesn’t provide any type of wireless connectivity and there is no other Dual WAN router from Linksys that uses any of the 2.4 or 5GHz wireless bands. In terms of security, you can expect standard DoS protection and a SPI firewall (set the number of access rules and block requests). Also, you get bandwidth management (set up the upstream and downstream speeds) and QoS (you can assign priorities based on the used WAN ports and protocols). Since the LRT224 is a VPN router, it features enough applications to keep your network safe. So, you get support for the IPsec, PPTP and SSL connections and some really cool applications to ease up the configuration system (which is a headache with most Dual WAN routers). 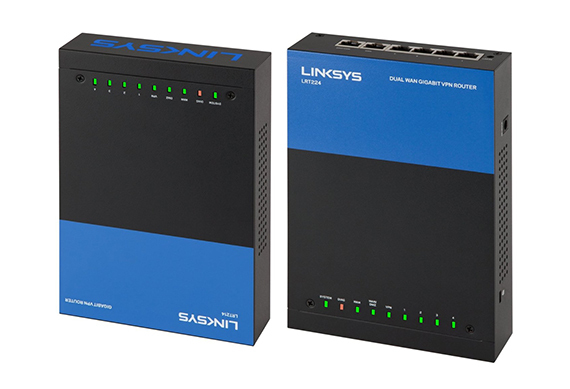 The Easylink VPN delivers a simpler way to configure the IPsec process for a gateway to gateway tunnel between two Linksys LRT routers (this feature is supported only between two Linksys LRT routers). All you have to do now, is to set a username, a password and insert the IP address of the second router. Furthermore, you can also use the OpenVPN client, being able to handle 5 SSL tunnels (it can handle up to 50 tunnels while using PPTP and IPsec). Also, in case one active tunnel fails, you can use the VPN tunnel back-up (choose the IP address of a second VPN router so you can connect to in case of a fail scenario). Note: As expected the two WAN connections have load balancing capabilities, so you can mix the bandwidth of both connections and at the same time, in case on connection fails, you can rely on the second one (never experience downtime). At the end, I have tested the speed performance of the Linksys LRT224 using a 1GB file and I got a download speed of 643 Mbps and an upload speed of 605 Mbps. 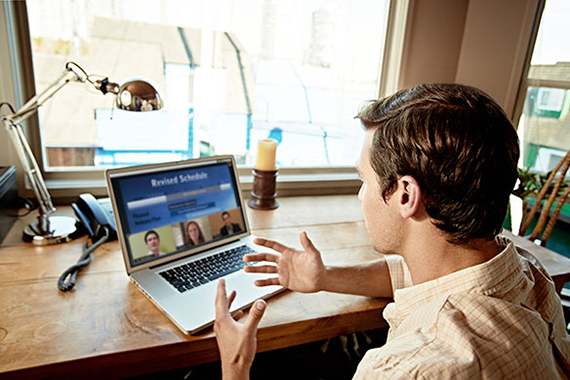 Cisco Systems is the largest and possibly the most known networking company in the world and its networking devices are considered to be some of the best. Since there is a high demand for dual WAN routers to maintain business networks, Cisco delivers a large array of these devices, varying in terms of WAN and LAN ports, speed performance and WiFi capabilities. The router we are going to focus is the Cisco RV320. On the front of the router to the right of the protruded silver band, we get a separate section specially dedicated to showing the status LED lights (and a recessed RESET button) paired accordingly: first array is responsible for Power, VPN, DMZ and DIAG, the second array refers to the four LAN ports, the DMZ/WAN and WAN, each with two LED lights for LINK/ACT and GIGABIT. Lastly, we get two LED lights for the USB 1 and USB 2 ports. On the back of the router you will find the ON/OFF switch, the Power port, four Ethernet LAN ports, one DMZ/WAN port, one WAN port and a USB 2.0. The second USB 2.0 port can be found on the left side of the router. Overall, it’s not really a big router, measuring 8.1×5.2×1.7 inches and weighing 46 ounces, but since it is a bit taller than the other routers in this list, it is unlikely there will be any overheating, simply because there is better airflow inside the case. 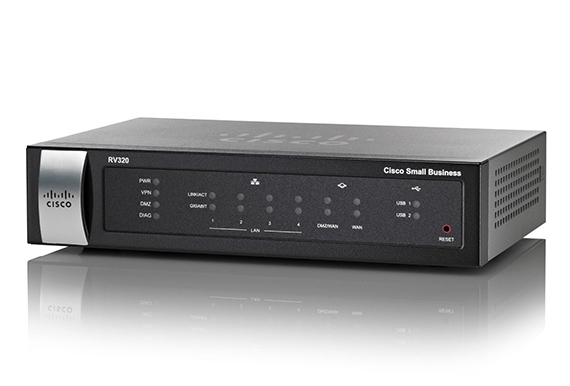 In terms of hardware, Cisco RV320 comes well equipped. It features a dual-core Cavium CN5020 CPU (clocked at 300 MHz), 256MB of RAM and 64MB of flash storage. Furthermore, you get a Broadcom BCM53125M 7 port switch for the Ethernet ports. Unfortunately, there are no WiFi options, so if you wish to make use of the 2.4 or the 5GHz radio bands, you will have to look for the Cisco routers which have the letter W at the end (for example, Cisco RV215W, RV220W or RV110W). The RV320 is a dual WAN router, so you can expect traffic load-balancing over both WAN ports (although you can use one WAN port as main and the other WAN port as backup, in case of failure). Also, the RV320 is a VPN router, using methods like IPsec (with support for up to 50 IPsec tunnels), PPTP (supports 10 tunnels) and SSL (support 10 tunnels). The router’s firewall features three main options: enable or disable the SPI (Stateful Packet Inspection), the WAN ping or DoS, use content filtering or create access rules for a specific IP address or a range of address and for a targeted port or protocol. In terms of speed performance, the Cisco RV320 is a very capable router, managing to maintain 856 Mbps while downloading a 1GB file and 687 Mbps while uploading it. DrayTek is a Taiwanese manufacturer of (mostly) enterprise-grade networking products, including VPN devices, firewalls, routers and other types of wireless LAN devices. DrayTek is known as being one of the first manufacturers to implement the VPN technology into less expensive routers and, right now, it basically is the go-to-company if you don’t want to purchase very expensive equipment from Cisco, Arista or Juniper (therefore being a godsend to start-up companies that don’t have a large budget). One of its more interesting products is the DrayTek Vigor2925AC, a dual WAN router that also has 802.11ac wireless capability. 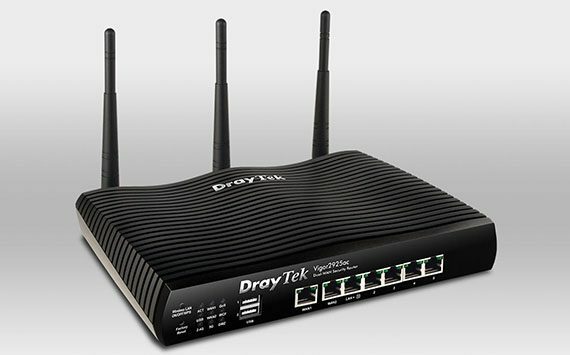 Usually, Dual WAN routers aren’t very aesthetically pleasing and most have a boring, plain look (begging you to hide it in some corner), but DrayTek went for a different approach when it designed the Vigor2925AC. The case remains rectangular, but the top has a wave-like form, covered by a black matte finish and lots of small longitudinal canals. While some other dual WAN routers are metallic, the case of Vigor2925AC is entirely made of plastic and, while I wouldn’t go as far as calling it beautiful, at least it has the element of uniqueness and it doesn’t look as the other routers on the market. The footprint of the Vigor2925AC is a bit large (measuring 9.4 x 6.5 x 1.7 inches) and the device weighs about 2 pounds (since it’s not a light router and because of the larger footprint, the Vigor2925AC will feel sturdy and stable, even if you connect lots of cables). On the front of the router, you can find a series of LED lights which show the status of ACTivity, WAN1 and WAN2 (if it’s blinking, it means that the data is transmitting), QoS (if it’s on, then the QoS function is active), USB (if it blinks, then data is being transmitted), WCF (it’s on, if the Web Content Filter is active), 2.4G, 5G and DMZ. On the left of the LED lights, you can find a pair of buttons, one for Wireless LAN ON/OFF/WPS (to turn on the WPS, press the button once and wait for the client to connect to the network through the WPS; press the button twice to either enable or disable the wireless connection) and a recessed one for returning the device to the factory default settings (press and hold the button for more than 5 seconds). On the right side of the LED lights, there are two USB 2.0 ports (useful if you want to connect a printer) and a series of ports: a 1000Base-TX RJ-45 WAN1, a 1000Base-TX RJ-45 WAN2 and 10/100/1000Base-TX LAN RJ-45 LAN 1 to 5 (each port has two LED lights – if the left LED is blinking, it means that data is being transmitted; if the right LED is RED, then the port is connected at 1000Mbps, otherwise, if it’s off, the connection is at 10/100Mbps). The rear side is populated by a PWR connector (for the adapter), an On/Off switch and three detachable antennas. Inside the case, the DrayTek Vigor2925AC is equipped with an Atheros AR8327 switch chipset, 128MB (128M x 8 Bit) Toshiba TC58NVG0S3ETA00 flash memory and 128MB of RAM (EtronTech EM68C16CWQD-25H). The Vigor2925AC has built-in hardware which ensures a proper WiFi experience and, since we’re dealing with an AC1600 device, the maximum theoretical throughput is 1,300Mbps using the 5GHz frequency (802.11ac standard) and 300Mbps using the 2.4GHz radio band. Sure enough, interferences and other type of impediments will affect the speed and, in real life conditions, you’ll get an average of 440 Mbps at close range (5 to 10 feet). In terms of software features, DrayTek Vigor2925AC doesn’t lack anything. You get the dual WAN port used for FailOver and load-balancing (the second WAN port is ‘Active on demand’, while the WAN1 is set as primary): if the first Internet connection fails, the router automatically switches to the other WAN port (the process doesn’t take more than 15 seconds) and you can also use the load balancing feature which keeps both Internet connections active at the same time. Furthermore, the USB ports allow you to insert a 3.5G/4G LTE modem and use it as either primary or back-up WAN. The Vigor2925AC also supports VPN load-balancing and backup for site-to-site applications (VPN Trunk), 50 VPN tunnels with comprehensive secure protocols, Smart Monitor Traffic Analyzer (50-nodes), CVM (Central VPN Management) and a lot more. In terms of security, the Vigor2925AC features an Object-based SPI Firewall, DoS Prevention, CSM (Content Security Management), Multi-NAT, DMZ Host and more. The wired performance of the router while transferring a 1GB file was very good: while downloading, I got a maximum of 906 Mbps, with an average of 860Mbps and while uploading the file, I measured an average of 735Mbps. Furthermore, I tested the power consumption and, in idle, the router used about 6.3W and, using the load balancing and the 802.11ac WiFi at the same time drew about 10W. 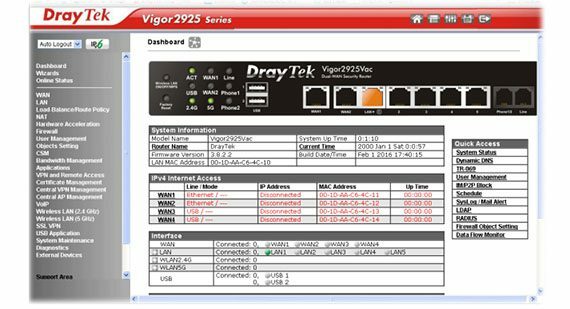 Note: The DrayTek Vigor2925 is also available in other variations: with integrated VoIP (the Vigor2925Vac and Vigor2925Vn-plus only), using either only the wireless N technology or with both 2.4 and 5GHz frequencies (Vigor2925n and Vigor2925n-plus), compatible with Fiber (Vigor2925F) and the basic Vigor2925 which lacks any WiFi implementations. Note: For more info about Peplink Balance One, you can also check it out at the official Peplink website. Starting up a new business is more stressful than one may expect and since this is the 21st century, having a reliable, continuous Internet connection is now a vital component which can make all the difference. Peplink is a California-based networking devices manufacturer that promises to rise up to the expectations by featuring a large array of Dual WAN routers, allowing you to choose the most suitable for you, considering the size of your business and the available budget. Since we are focusing on routers for small to medium business (SMB), the device that caught my attention is the Peplink Balance One, which is a significant improvement over the widely popular Peplink Balance 20. 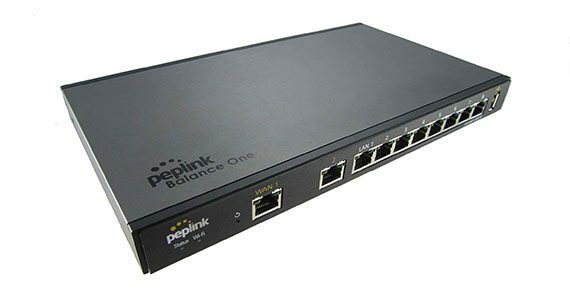 The Peplink Balance One has adopted pretty much the same look as almost all other business-type routers, which means that it features a rectangular black box, but lacking any ventilation cut-outs on the sides and anywhere around the case. The fact that dual-WAN routers manufacturers often decide to use metallic cases is a good choice, as it makes the routers feel more premium, but, this time, Peplink decided to cut some corners and went with plastic, so it does not have the same touch and feel. Furthermore, the manufacturer decided to not equip any fan, so the device takes advantage of passive cooling, therefore, it runs silently (because there are no ventilation holes, it is advisable not to put anything on top of the router and make sure that there isn’t anything between the six bottom feet – this way, the Peplink Balance One will keep a decent internal temperature even under heavy load). While the Peplink Balance 20 had a yellow band on the front side, the Balance One is simply black with a small Peplink logo on the front, so, overall, the design doesn’t feel bold in any respect since the manufacturer adopted a more cautious and conservative approach in terms of looks. Anyway, you won’t put it on display in the middle of your living room (if you do, we won’t judge) so not much is lost using a more plain design. The Peplink Balance One chose to put both the status LED lights and the main ports on the front of the router: from the left, there’s the Status LED (green means that the device is ready, solid red indicates that the router is booting up or is busy, while flashing red shows a boot up error) next to the WiFi LED (if it’s off while the device is powered on, then the WiFi is turned off), there’s also a recessed Reset button (which can be accessed with a paper clip), a WAN 1 port, a WAN 2 port (both Gigabit), eight Gigabit Ethernet LAN ports and a USB 2.0 port (supports a large variety of 4G LTE/3G modems). Each of the WAN and the LAN ports have two LEDs, one for showing that the data is transferring (it will flash orange) and the other for showing that a device is connected to that port (green LED). On the rear side of the router, you can only find the Power connector, a useful cable holder and the Kensington Security Slot. Turn the router upside down and you can find four rubber feet and a sticker which contains the Serial number, the LAN MAC address, as well as the default username and password (it’s usually admin for both). Unfortunately, if you decide to mount it on the wall, the Peplink Balance One lacks any holes on the bottom. Note: In terms of size, the Balance One isn’t necessary a big router, measuring 1.2 x 10.7 x 6.3 inches and weighing 1.3 pounds. Inside the case, Peplink Balance One is equipped with a QorIQ P1020 processor clocked at 800MHz (800/667 MHz), a Broadcom BCM53128KQLEG UN1519 P20 Multiport Gigabit Ethernet Switch, four U-TRON 1552D GSC-4807P-R 100/1000BASE- Tx Transformers and two U-TRON 1547D GSC-2424P-R Transformers. While the Peplink Balance 20 did not have any WiFi capabilities, the Balance One does features both the 2.4 and the 5GHz WiFi radio bands (the 802.11ac/a/b/g/n standard) and the antennas are internal. Since you’re most likely to put the Balance One in a closet and forget about it, I would suggest to get a reliable access point, since the WiFi performance is not really that great by today’s standards (or take a look at the Core variant which lacks built-in WiFi). By default, the rate throughput of the Peplink Balance One is 600 MBps, but, if you need more WAN ports, you can activate the BPL-ONE-LC-5WAN license which will convert the LAN 1, 2 and 3 into WAN 3, 4 and 5, so, you get five WAN ports available – but, be aware that in this case, the throughput will be reduced from 600 Mbps to 400 Mbps. Now, as said before, this is a dual WAN router, so you can take advantage of the load balancing feature, which can be customized by defining specific traffic types and prioritize them (supports failover and failback) and, after a few firmware updates, you can also use the link aggregation LACP feature. 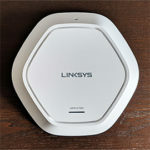 Additionally, thanks to the USB 2.0 port, the router supports WWAN connectivity (a wireless form of connecting to the Internet, using cellular tower technology). Other important features are the port-based VPN (you can choose between trunk port or access port), QoS (for E-Commerce and VoIP), per-user bandwidth control (create up to three groups of users and set bandwidth limits), web filtering blacklists (the Lite version) and PepVPN, which creates a secure Ethernet tunnel over any IP connection (L2/L3) and it is fully compatible with any dynamic IP environment and NAT (it will also work along with SpeedFusion). Furthermore, the Balance One supports InControl Cloud Management and thw aforementioned SpeedFusion (as an optional add-on). 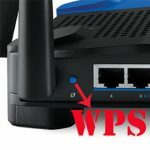 Synology is a popular manufacturer of networking products, well known for its NAS line and, last year I was a little surprised to see that it decided to leave the comfort zone and release its first wireless router, the RT1900ac (which offered a good price-to-features ratio, a more than decent wireless performance and an excellent user interface – possibly one of the best). 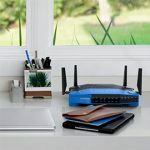 It seems that Synology grew quite fond of the router market and it has now released a second device, the RT2600ac, which besides offering a superior wireless performance and lots of great features, it also has dual-WAN capabilities, thus making it suitable for this list. The dual-WAN routers aren’t a common occurrence in the consumer market and even if some would argue that the RT2600ac focuses more towards the tech-savvy, enthusiast audience, you’re not going to get the usual metallic rectangular box, but an attractive, carefully designed plastic case. 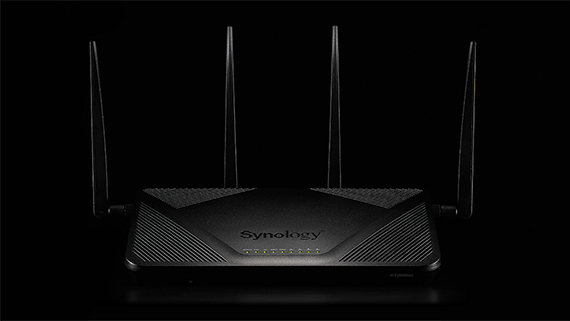 Synology kept the overall look of the RT1900ac, but it has improved some key elements to make it stand out: the RT2600 looks less dynamic than its predecessor (which looked like it would jump right at you), but it has two antennas on the left and right side that gives it a slightly ominous look. Furthermore, the top side still has that small protruded zone, but there are now four sections with long and narrow cut-outs which ensure a proper airflow and keep the case cool even under a heavy load. 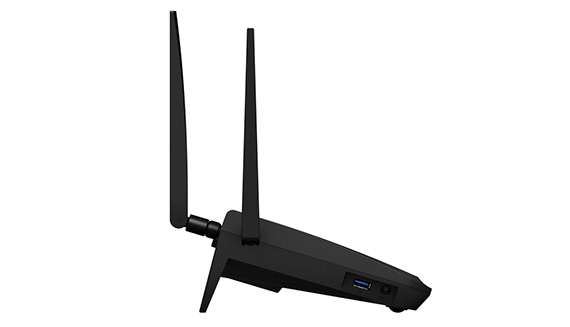 The RT2600ac has also gained a bit in terms of weight and size (weighs 1.54 pounds and measures 3.0 x 11.0 x 6.6 inches, without taking into consideration the antennas, which are detachable). The RT2600ac still has those two characteristic feet that can be used if you don’t like your router to sit flat on the desk (they also help a great deal to dissipate the heat) and, you also get the option of mounting the device on the wall using the two mounting holes on the bottom. While the RT1900ac had the LED lights on the front, the RT2600ac has them positioned on the protruded top section, along with the Synology logo. The LEDs show the STATUS of the system, the connection status of the 2.4GHz and 5GHz radio bands, the WAN and for the four LAN ports. 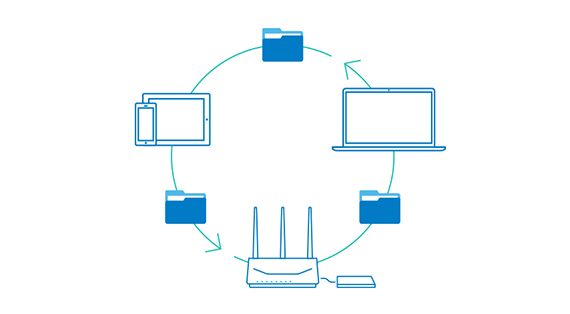 Also on the front panel, Synology has equipped the router with an unusual SD card slot, which is a convenient way of easily transferring files with any clients connected to the network. 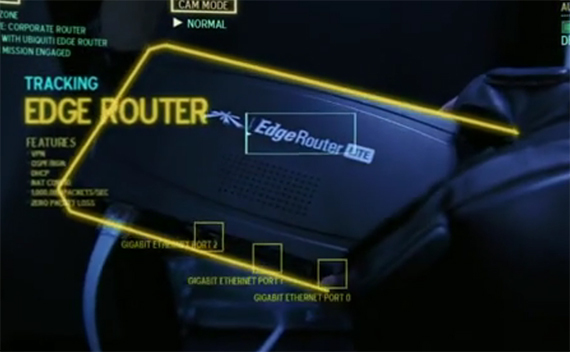 On the rear side of the router, you get access to two of the four antenna bases, the Power button, the Power port, a Reset button (hold it for ten seconds to reset the device to factory default settings or for 4 seconds for a soft reset), a USB 2.0 port, a single WAN port and four Ethernet Gigabit LAN ports. On the left side, the RT2600ac has a USB 3.0 port and an Eject button (used to eject any USB or SD external storages), while on the right side, there’s a WPS button and a WiFi switch (for turning on or off the WiFi). Inside the case, Synology has equipped the RT2600ac with a 1.7GHz quad-core Qualcomm IPQ8065 CPU, 512 MB of RAM, 4GB (Toshiba) / 8MB (Macronix) and a Qualcomm Atheros QCA8337 switch chip. Furthermore, each radio bands takes advantage of the Qualcomm Atheros QCA9984, while the 5GHz band also has a RFMD PA5542 power amplifier and the 2.4GHz has a Skyworks SE2623L power amplifier. The RT2600ac features a maximum theoretical data transfer rate of 1,733Mbps using the 5GHz band and up to 800Mbps using the 2.4GHz band. Of course, in reality, you won’t really get close to these numbers and, using a high-end laptop with a 2×2 wireless adapter, I was able to measure about 605 Mbps, 5 feet away from the router (on the 5GHz band) and about 421 Mbps at 30 feet. Note: The wired performance of Synology RT2600ac was acceptable, reaching up to 940 Mbps for both WAN to LAN and LAN to WAN tests. One of the main attractions of the RT1900ac was the uniquely designed, feature-packed user interface (which resembled the Windows OS) and it seems that the RT2600ac also takes advantage of the user-friendly UI, which now incorporates lots of features (such as the Download Station, that includes BitTorrent and usenet, Smart WAN and Smart Connect) and optional add-ons (such as the VPN Plus Server or the Intrusion Prevention). Of course, the feature I’m going to focus on is the Smart WAN, which ensures Dual WAN load balancing, failover support or policy route. As you can see, the RT2600ac does not have two dedicated WAN ports, so you will use one LAN port as the second WAN interface (this way, you are left with only 3 LAN ports, so a switch may be a necessity). This configuration allows you to set up the Failover (and failback, once the primary interface is back to normal operation status – that can happen when one Internet connection fails), Load Balancing (two interfaces will work together and, in case one fails, it will switch to the failover mode), interface priority, policy route and interface checks. Thank you for your informative article regarding best Dual wan routers. I am a novice so my questions might be annoying. I am in the Philippines (but travel back to the states regularly) and I have two ISPs that I want to use together in a dual wan router so that if one isp goes down, the other one can kick in. Also, I do quite a bit of VOIP calls from Philippines back to the USA. Call quality is important to me and my calls are often dropped because latency is a problem. So i would like a dual wan router that automatically prioritizes VOIP calls and reroutes around bad servers, etc. 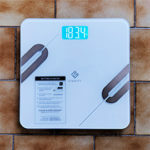 It seems like from your review that the Peplink Balance One would be a good option for me. Also very important to me is to choose a dual wan router that also will perform as a good VPN router so that everything I do in the Philippines looks like I am in the USA. This will help me with my business and websites that block philippines ip address, also i would like to watch amazon prime which is blocked in Philippines. 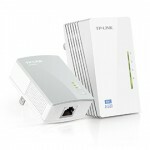 do you recommend the peplink balance one for me and if not, which dual wan router would you recommend for my situation? 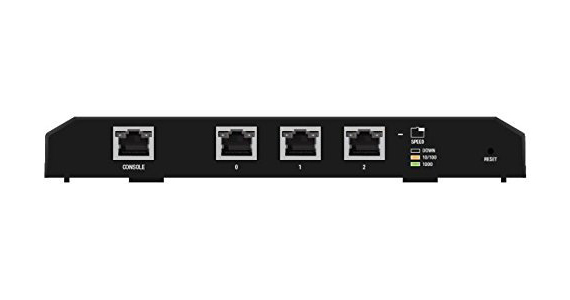 question 2: do i need a dual wan router that has DD-WRT built in or can be flashed or can I simply use the VPN solution already included with each router to fit my situation? I would appreciate any advice that you can give to me. Sorry for the late reply. The Peplink Balance One should provide everything that you need, including built-in VPN and a low latency, but, as another user has pointed out, you’re not going to see close-to-Gigabit throughput – although, for most applications it should be more than enough. You could also have a look at Mikrotik for some great dual-WAN solutions at a very good price. I would have liked to see more information on these routers. For example you didn’t mention that the Synology RT2600ac offers very very little control over the dual wan route policies, as far as I can tell it just lets you specify by source ip and/or destination ip. You also make no mention of peplink balance ones more advanced algorithms like the lowest latency and the new fastest response time (personal favorite) as far as I know its pretty much the best dual wan router if you’re ok with 600mbps throughput. 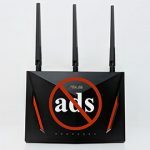 I haven’t tested as many as you though so if any of these routers offer something like the fastest response time algorithm peplink offers please let me know. It is true that the RT2600ac is more limited when compared to the other routers in this list and since I did have in plan to retest the Peplink Balance One for a while now, I will try to create a proper, in-depth analysis of its main features and its performance in a separate article (not just some quick highlights like I did in this article) in, hopefully, a month, a month and a half.